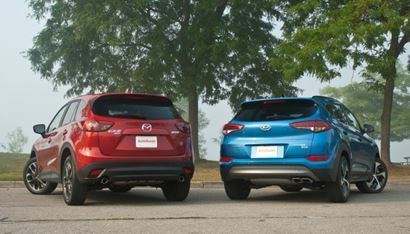 Compact crossovers sell like popcorn at a movie theatre and here we have an industry favorite versus the handsome new guy, the Mazda CX-5 versus its Hyundai Tucson counterpart. 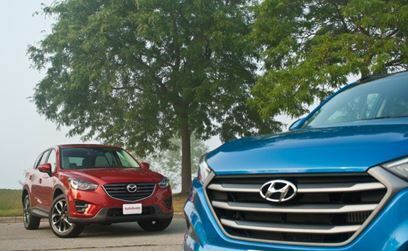 Although it doesn’t sell nearly as much as the Honda CR-V (335,019 units sold in the U.S. in 2014) or the Toyota RAV4 (267,698), the Mazda CX-5 (99,122) has always been our top pick in the segment for its legitimately sporty driving dynamics and good looks. The Hyundai Tucson (47,306), on the other hand, sucked for a really long time, but it has been totally redesigned for the 2016 model year, and the revamp allows the CUV to properly fight it out with the segment’s best. Is the Tucson’s makeover enough to steal our “favorite” vote away from the CX-5 for the compact crossover segment? After driving the two crossovers back to back, one thing become very clear: the Mazda is still the better car if driving fun and engagement is what you’re looking for. It feels more connected to the road, you get much more feedback from the direct and responsive steering wheel, and it just dives into corners with more enthusiasm than a crossover has a right to. Unfortunately, engaging driving typically matters diddly squat to people shopping this segment. That’s a shame, because the CX-5 is the best in its segment for driving dynamics. That’s not to say the Tucson is a bad performer, either, but you can really feel Mazda’s sporting heritage in the way the CX-5 drives. The Tucson, on the other hand, feels softer in the corners and the steering feels a bit disconnected, artificial, and over-boosted, all pretty typical traits in this segment. On the highway, you will find yourself over-correcting your steering in the Tucson because it is too light at high speeds, although the lightness helps when navigating tight areas like parking garages. Because the Tucson is softer sprung though, it feels more comfortable and floaty over rough pavement, where a bit more roughness and NVH makes its way into the CX-5’s cabin. 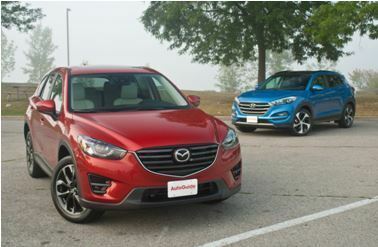 The CX-5 in our comparison is powered by a 2.5L four-cylinder engine with 184 hp and 185 lb-ft of torque, while the Tucson is powered by a 1.6L turbo four with 175 hp and 195 lb-ft of torque. The CX-5 has to haul around less weight though, because it weighs about 120 pounds less than the Tucson, a weight difference that can really be felt in how much more agile the CX-5 is. The big difference is that the CX-5 isn’t actually that fast and its engine isn’t all that inspiring, but it feels quick. The Tucson pulls stronger and earlier on in the rev range, so its torque feels more useful, even with the extra weight. The turbo four is hooked to a seven-speed dual clutch transmission, which feels really well sorted at speed; it upshifts smoothly and quickly and downshifts are well timed. The only issue, and this is the same thing with most DCTs, is that at low speeds and from a stop, it has a tendency to judder and slip for a fraction of a second before it finds the right gear. The CX-5 has a traditional six-speed auto, so it doesn’t have this problem, but the car also doesn’t have a turbo, so you have to get the engine revving quite high to get the best from the engine.